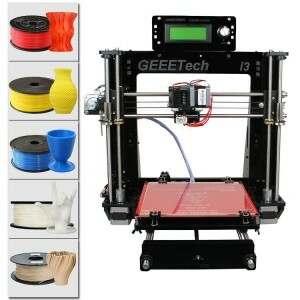 Geeetech Rostock 301 is an affordable desktop 3D printer for tech enthusiasts, serious hobbyists and . 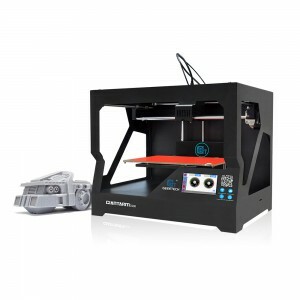 This printer provides you with excellent printability and triple-color, mix color capability, offering an intuitive 3D printing experience. 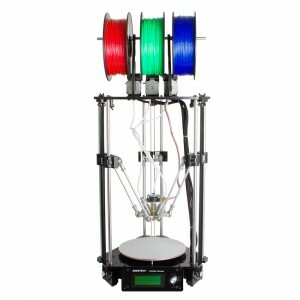 Rostock 301 is a perfect combination of the delta type construction and the 3-in-1-out mix color 3D printing hotend. Delta type construction features faster printing speed and high printing accuracy; the 3-in-1-out mix color 3D printing hotend gives a rich mixture of color combination of the printing object. Rostock 301 maintains DIY property, with which you can unleash your creativity to refit or modify it as you like. This kit is just the beginning; you can get more out of it. 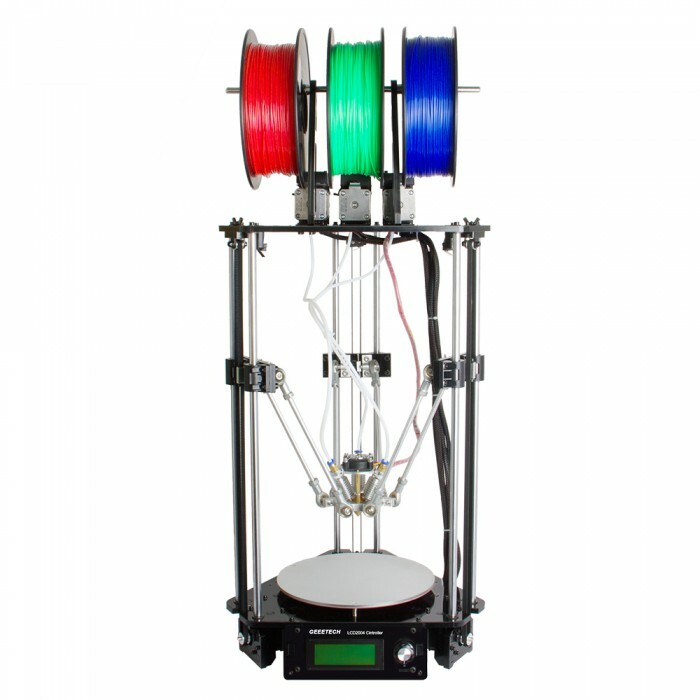 The 3-in-1-out mix color 3D printing hotend is a single nozzle hotend for 3D printing in multiple colors that requires a minimum of calibration. 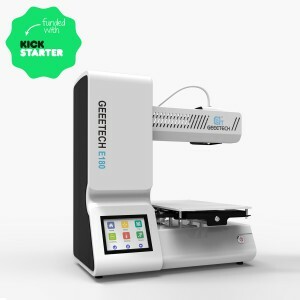 It allows you to feed three filaments through three independent feed-in channels and be extruded out through one nozzle which provides a faster, easier and more precise method of 3D printing and this can be a new frontier of 3D printing. The single nozzle eliminates the calibration problems associated with having separate nozzles for each color, and the single output orifice alleviates the problem of out-of-level nozzles hitting the working surface being created. Hardware: We upgrade the GTM32 3d printer controller board so that if features everything you need to build your printer for multi-color printing. GTM32 3d printer controller board is powered by STM32F103 which uses the Cortex-M3 core, with a maximum CPU speed of 72 MHz. It offers a 32‑bit product range that combines very high performance, real-time capabilities, digital signal processing, and low‑power, low‑voltage operation, while maintaining full integration and ease of development. We added a new Mixer feature to control the percentage of the feed rate of the 3 filaments. It allows you to time exactly when and where the color changes. Working as a palette, the three filaments of different colors will be fed in accordance with a certain percentage of feeding rate, then they will be melted and mixed in the nozzle chamber to generate another new color or mixed color, enables the printing of model with any color. 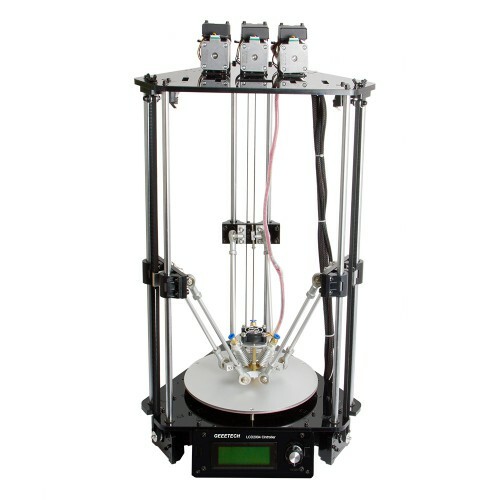 The benefit of a Delta printer is that the moving parts are lightweight so that it’s easier to travel. That results in faster printing with greater accuracy. To ensure the print speed, we have designed the hotend to have the smallest possible weight of 175g; the print speed can be up to 120mm/s. You can also use Rostock 301 as a single extruder printer, a dual extruder and a 2-in-1-out extruder, which gives the printer an open color system; this means you’re able to use nearly any color to get precisely the effect you’re after. When you combine different colors, the possibilities are endless. With our Mixer feature, you can get blending color, mix color and even full color for one printing project. 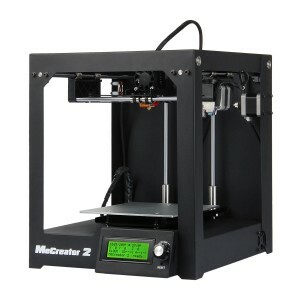 Hi there, I bought one of these printers a while ago but due to problems with calibration I got so fed up with it it has just sat there gathering dust I see your tech service replys say that there is a new firmware with colour mixing included where can I download it from, also among many questions about auto calibration I saw replys saying it is nearly ready and that was back in 2016 so is it ready now or are all the buyers still waiting for it several years after being told that it is nearly ready? So is it time for me to brush the dust off it and give it another try as I have never managed to print anything. Regards Poppy Ann. can u please send me order number?where you buy the printer? from website or ebay? Hello, I get in touch because I would like to know if they send to Argentina and what the cost would be. good afternoon. at me in Rostock 301 the hotend has broken. one of Barrel broke. to unscrew the debris did not work, I had to drill. the channel in a diamond has hammered in - it is impossible to clean. what should I do? hello , can u tell order number? for the nozzle, you can heat it up then use the pin to clean it but please be carefully the heat nozzle. 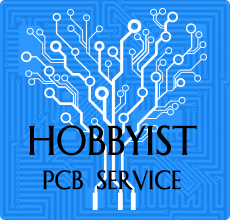 by the way, we have upgraded the hotend, you can find in our website now,this can solve clog problems. hai im srikabilan from Mr.BOT Robotic school in tamilnadu, India. i need 3 pieces in this model. how can i get ? and i have few questions about this printer i need a service call. if you clear that all i will bought it immediately within two days. Hi is it still in stock in European warehouse? Hi, R u sending to Brazil??? Postal Code: 187003-756. If yes, Have Shipping cost? Hi is Auto Level function available for this model? changing color of printed item, from software or from printing machine while printing? HiMohaned, control it by LCD. Hello, I place an order, but still waiting to pay, I would like to be sure how to send my item, by DHL or any other way and it will cost me more? Hi, where to send it? Do you have a G2S update parts or kit? Were to connect the wire from the 3d Touch on the Board? 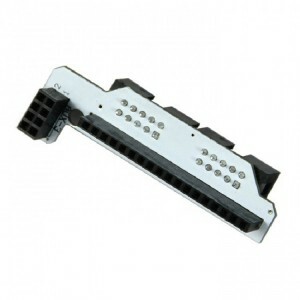 hello, please send me picture of the parts, if confirmed, we will send you free replacement. Hi izadi,sorry for late reply.You can email to me if you have any probelms:jocelin.jia@geeetech.cn.I will help you. Does this printer include a warranty? If so, what is the length and what is covered? Has auto leveling been implemented yet? Hi, and where can i plug in the 3d touch on the Board? Having problems with the home function. The motors do not stop when I press home even though they have pressed the switches at the top. 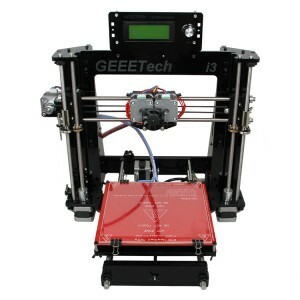 Hi John ,sorry to hear that ,you can email to our tech:technical@geeetech.com for help. Hello there i have just got a Rostock 301 same as the one in the picture above, i know this has been an ongoing question for the past year. but has there been any update on the auto leveling yet as it would make the printer alot better I.M.O. Hi Josh ,sorry that the auto leveling still on processing ,pls note with thank. can i kindly ask why it is taking so long? Hi Josh ,as the board need new design . 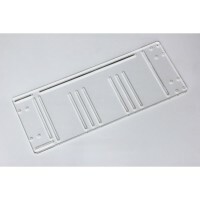 Hi Zina, is there really going to be a new board or is Geetech just saying that to customers to stop them moaning? I am one of those customers that have a machine that I cannot get it to work correctly as I cannot get the leveling sorted out no matter what I do if there is not going to be a new board please tell us so we can try something else to sort this problem out. Regards Poppy Ann. Hi Poppy ,for the board is same as before by GTM32 pro Vb .If the printer have any problem you can email to our tech :technical@geeetech.com for help . Hi Stan ,can you email to our technican for help by :technical@geeetech.com? Any news on auto leveling yet? Hi Ian ,sorry that ,still on processing . Hi Ian ,our technican not advice that. I broke the latch part of the FPC connector on the LCD2004 display. Can you tell me the manuf and part number for the connector so I can buy a new connector to take the latch from, please? 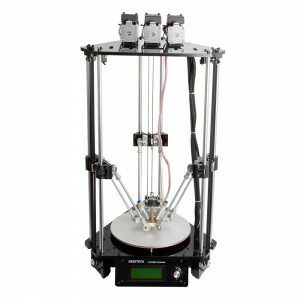 I have bought this printer last week and saw that the 6 rods where not the same length and the bearings where tight exept one. Now they are all the same length but the head goes after a while towards the bed when i'm printing and hits the bed. What can i doe about this? HI Rami,You'd better calibrate it with Repetier Host. And please confim your printer settings is right. Just refer to the user manual. The user manual includes two calibarate parts. One is via Repetier Host, and other is via LCD. Not Gcode. Hi who do I contact for a part that is missing from my kit? I am missing the FPC ribbon cable. It was not packaged with the LCD2004. Hi Robert ,do you have an order number for the printer ?where you buy the printer ? Have you contracted the related sales for the missing part? Thank you for your response. I have resolved my issue. 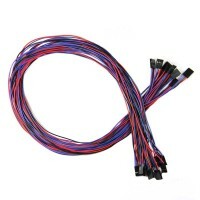 I do have one more question regarding the FPC cable, what is the pin count of theach FPC cable? Hi Robert ,it's 4pins . Hi Matthew, you can correct it with Delta Radius. For example 89 set to 90. It will correct the height in the center. Any update on the auto-leveling update? I have been having problems getting the printer level. Once I have the outside coordinates at the correct height the center is too high. I adjust the Delta and the outside coordinates heights too high. I readjust the outside coordinates to the proper height and the Delta needs to be adjusted again. This happens every time i try to use the printer. I have the printer and the printer bed level so that is not the problem. Hi Matthey, you can correct it with Delta Radius. For example 89 set to 90. It will correct the height in the center. Hi Matthew, are you still having problems with this issue? if you have, do you have experience on compiling and uploading firmware? When you do: in arduino IDE look into the configuration.h file and search for the following line. #define DELTA_RADIUS (DELTA_SMOOTH_ROD_OFFSET-DELTA_EFFECTOR_OFFSET-DELTA_CARRIAGE_OFFSET-2) // __ standard it was +1. compile and upload, if it gets worse try a positive number, and do not increase or decrease to much at a time, for fine tuning you can go to 2 decimals for example 2.05 or 2.12 these are very small adjustments and very time consuming but are worth the time afterwards. have a nice day and lots of 3D fun. Btw i never use the auto leveling. I even dismounted the probe. i used a calliper to set the bed hight on the three screws at the same hight and got the printer head almost parallel with the bed using the above adjustments. Вы дали инструкцию по сборке, а нам нужна инструкция по подключению к компьютеру, куда и как устанавливать прошивки, программы и т.д. Не можем работать на принтере, потому что не можем понять и из тех инструкций что у нас есть как его настроить на работу. Пожалуйста дайте подробную инструкцию по подключению принтера..
Hi ,for the building instructions is here:https://www.geeetech.com/Documents/Geeetech%20Rostock%20301%20building%20instruction.pdf ,you can take for a referrence . When do you think you can finish the software color control and auto level? Do we just upgrade firmware online, without change any hardware? Thanks! Hi Sam ,recently we will not upgrade it ,If will we will upgrade the firmware online. What is the current firmware? 1.0.03? Hi Robert ,pls use the 1.0.1 one which will more compatible to the computer. Can you verify? Rostock Manual link to Forum shows 1.0.01 is old and 1.0.02 is current. However Easyprint updated firmware to 1.0.03. This Confusing to me. 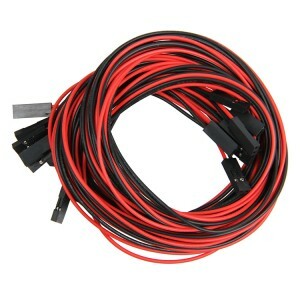 Should I only use 1.0.1 then for my Rostock 301 diamond 3 in 1 hot end? Hello Robert ,just use the 1.0.1 one for your printer ,this is the one more compatible to your printer . Does firmware of Rostock 301 support G2 or G3 move that make arc? Or it support only G0 or G1 that draw straight lines? Hi Song ,sorry that ,the G2 and G3 cannot be compatiable. than can I install Marlin firmware in this printer? 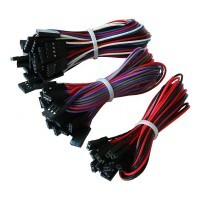 Hi Song ,the firmware just can be used on 301 mix color printer. Hi, What is the status of the auto-leveling function? Will it become available as firmware update soon? Will color mixing also become available in the software during printing? Hi Vincent,the auto-leveling is still on developing now . I'm planing to Buy the Rostock 301 but was hoping the auto-leveling now was available or coming available very soon. Hi Vincent ,our technicans are developing it . The mixer in this product is a fine feature, but the printer lacks general Gcode commands to make it really usable (mixing only via menu, pause functions missing (to insert bolts/objects inside your prints), ...) Quality(/torque) of extruders versus consistent throughput of the diamond hotend is an issue. 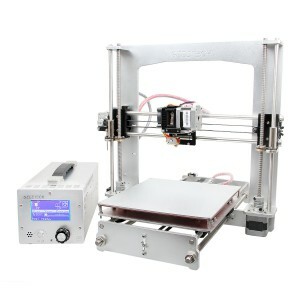 - I'm praying and hoping for Gcode documentation and extensions such that it is clear what is and isn't supported + dream of controlling this printer better in an automated way. According to me FDM multicolor is a future key differentiator, so the Rostock 301 is the good direction, but to take a lead position Geeetech should actively enchance in more Gcodes supported! Hope and pray! Hi Mikael,Appreciating for your feedback and will feedback this to our technican.Thank you. After changed currency, the order was not showing amount to pay in another currency. Hello Olga,what happened? You can try to place a new one to check. 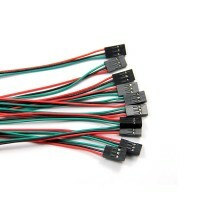 Hi, the temperature status of bed and hotend its always at 15 degree, without put to heat them. What i have to do ?. Before the temperature status give 0 degree. Should the tension on the belts be able to keep the Hotend from falling when the power is turned off? I also would like to add auto-leveling to my 301.
same for me.. auto leveling please!!!! hi !!! are you working on the auto-leveling fonction ??? im ready to buy one but i need the autoleveling fonction !!! your 3D touch probe work with this board ??? Hi,we're still working on the Auto-leveling on 301,please stay tuned.I believe it will be available soon. 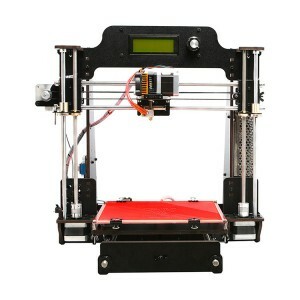 Hi WIlliam, I would like to purchase the Rostock 301, but I would like to purchase it with the Auto leveling function or will I be able to upgrade my printer after I have purchased it?. It is available now to purchase? It has been 2 months since your reply to Mathieu. I am just wondering where the progress is at. Thanks! Hello!! 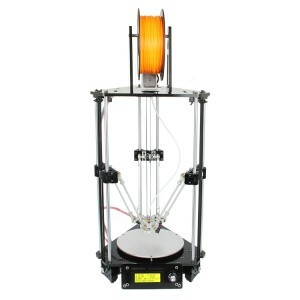 If printing volume is not an issue and 2 color-filament is enough, could you please help me to decide between Rostock 301 and i3 201... What are the advantages of this vs the other. Thank you very much!!!! Hello, 1.Rostock 301 can print an object that is higher and one more color than M201. 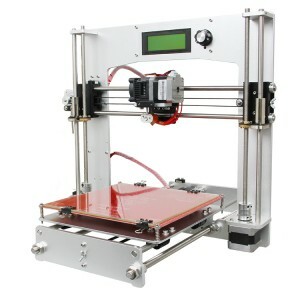 2.M201 has a more stable structure and a wider printing range. It depends on what function you actually need. hi, im having troubles with the extruder, the nozzle its covered... what is the steeps to clean this ? Hi,Julio First you should unplug the PTFE tube from the metal tube;Then heat the extruder to the melting temperature;Once it reaches the temp,plug the ejector pin(#F2 on the package list) into the metal tube to clean it. Hi, what's the average mounting time please. I'm not so bad are diy but it took me 5 hours due to some problems with the part 23, and the diagonal are not identical !!! 5 hours is not so bad. what is the problem with part 23 please? kit requires 8 screws not the just the 5, i've replaced them with some of part 22. 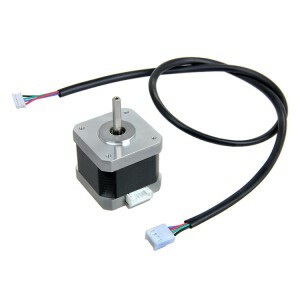 Hi, help me with the exclactly current for stepeer motors, is diferent value for axxis stepper than extruder stepper? 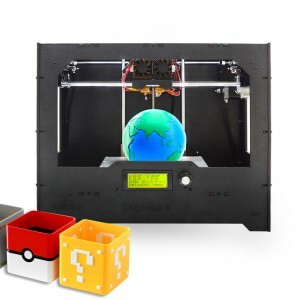 Can you add auto-leveling feature to this printer? yes, we are working on it. Once finished, we will let you know. Any word on when the auto-leveling feature will be available for the Rostock 301? I have had my 301 for six months and I have only been able to get ONE good print. where can i download the sourcecode? What i can find online just was firmware. I see the firmware but not the source code for the firmware. Is the source code for the firmware for the rostock 301 available somewhere? Thanks. Hello Matthew, I am sorry to tell you that the code for this printer is not open source. Why when you turn the power off does the print head go crashing into the heat bed???? that is not good. 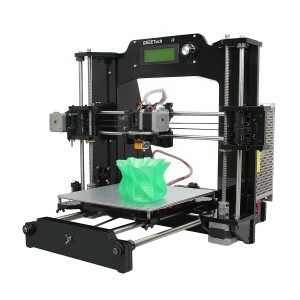 Hello Ric, you can find the firmware here http://www.geeetech.com/forum/viewtopic.php?f=20&t=17046. What do you mean by cannot find the print bed? it either crashes into heat bed or goes max....tried reducing the travel distance fro 220 to 210 still does the same thing...any other adjustment and the machine tries to do yoga...very disturbing...how do you level the print head to the bed when you cant even set the minimum height..the others are easy with the minimum screw...but this machine has none...i going to add one to end the frustration. part #23 in the kit requires 8 screws not the just the 5 you have sent and listed. 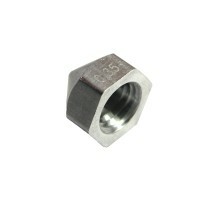 I am sorry to hear that, can you use the M3x20mm since it the 25mm is not enough. We will correct it. your instructions where wrong...that was not the correct screw...it was miss labeled.. It's possible to change the color via software or I can use only the LCD display? And can I use support filaments? 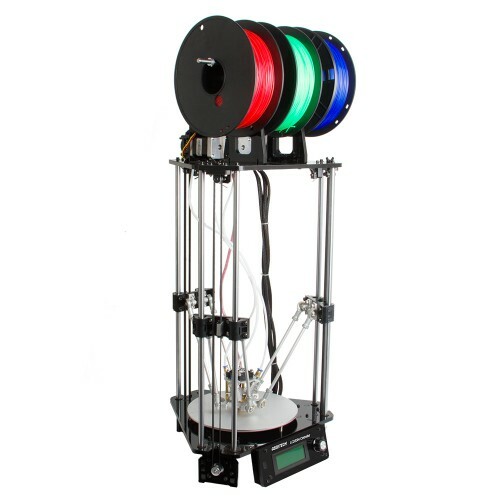 For now, you can only change it on LCD.You can use support filaments, but you need to set the other two filament feeding rate as 0, so that they will not be mixed. Can I upgrade my existing G2S Pro to 301. Do you sell the upgrade parts?